If a picture is worth thousand words, the graph below is a valuable illustration of two very important points that investors would be better off to remember. 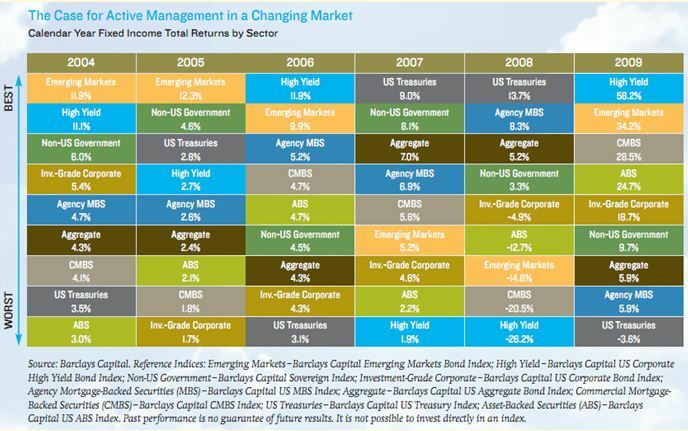 This graphic focuses on the returns from various sectors in fixed income market, but the same concept generally applies to equities too. The creators of the graphic intended to make the case for active management. I am assuming that anyone managing investments for themselves or others already believes in benefit of active management to some extent. The points I want to make go a little further. The first point is that sector selection is much more important for generating superior returns than individual security selection. You could be very active in selecting securities, but if they are not in the right sector, the returns might suffer, no matter how much effort is put into picking the individual bonds or stocks. The second point that this graphic makes to me is that, when I am picking funds, it makes sense to pick funds that have broader focus and a manager with expertise in multiple sectors. In other words, funds in which the manager has the expertise and ability to switch between different sectors may be able to do a better job than an investor trying to move between different funds. That thinking leads me to pick funds like PIMCO Total Return (PTTRX), Blackrock Global Allocation (MALOX), Vanguard Wellington Income (VWELX), and others. Note: A version of this article was originally published on Seeking Alpha.